This is a personally Hand Signed copy of the American actor and singer's Autobiography obtained at a book signing in Manchester. 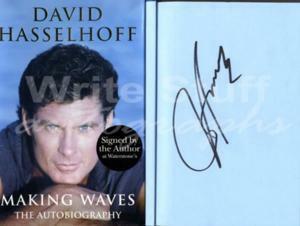 David Hasselhoff born July 17, 1952) is an American actor, singer, producer, and businessman. He is best known for his lead roles as Michael Knight in the popular 1980s US series Knight Rider and as L.A. County Lifeguard Mitch Buchannon in the series Baywatch. Hasselhoff also produced Baywatch for a number of seasons in the 1990s up until 2001, when the series ended with Baywatch Hawaii. Hasselhoff also crossed over to a music career during the end of the 1980s and the early 1990s. He was noted for his performance at the Berlin Wall at New Year's Eve 1989; he enjoyed a short-lived success as a singer primarily in German-speaking Europe. More recently, Hasselhoff has been involved with talent shows. He was the first celebrity eliminated from the eleventh season of Dancing with the Stars on September 21, 2010. He was also a judge on NBC's America's Got Talent from 2006 to 2009. In 2011, he joined the Britain's Got Talent judging panel, alongside Simon Cowell, Amanda Holden and Michael McIntyre. He appeared as himself in the 2004 film The SpongeBob SquarePants Movie and also Piranha 3DD and Hop .